We’re continuing our budget smartphones comparison series with two more models from Samsung today. Last time we looked at the Samsung Galaxy Core vs Samsung Galaxy S Duos 2 and saw that it’s still worth considering some of the company’s older models if you’re in the market for an affordable handset. Our contestants for today will be the Samsung Galaxy Core 2 and the Samsung Galaxy Ace 4, two more recently released devices that also fall into the budget category. As always, we’re going to be looking at specs, designs, prices, and more in order to figure out which of the two smartphones would be a better candidate for a potential purchase. 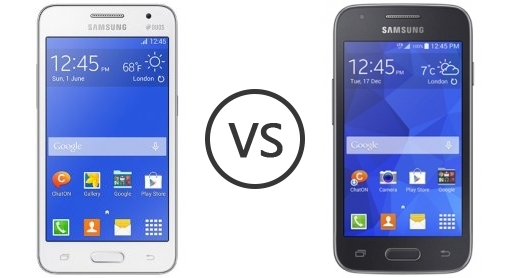 Without further ado, let’s kick off our Samsung Galaxy Core 2 vs Samsung Galaxy Ace 4 comparison. I’ll start right off the bat by saying that the Samsung Galaxy Core 2 looks much better than its predecessor and that’s because of a couple of key design choices. The phone has a more rectangular shape this time around and the back cover is covered in a faux leather material that’s very reminiscent of Galaxy Note devices. You’ll also notice that the handset is somewhat bigger and looks overall more polished than its predecessor did. The improved design has been complemented by the bigger display which comes in at 4.5 inches with 480 x 800 pixel resolution and 207 PPI. The Samsung Galaxy Core 2 weights 138 grams, measures 130.3 x 68 x 9.8 mm, and is available in black or white color options. As for the Samsung Galaxy Ace 4, we’re looking at a very different design, with rounded edges and a textured back panel. All in all, the device looks very similar to a number of other rounded compact smartphones developed by Samsung, including the Samsung Galaxy Ace 3. In other words, if you’re already familiar with the company’s work, the design will not offer any major surprises. The Samsung Galaxy Ace 4 packs a 4 inch display with 480 x 800 resolution, just like the Ace Galaxy Core 2, but with more pixels per inch, namely 233. Here color options include Iris Charcoal and Classic White while the dimensions and weight are coming in at 121.4 x 62.9 x 10.8 mm and 123.8 grams, respectively. Seeing as how both these device fall into the affordable category, the hardware is not exactly something to write home about, although if you’re only looking for something that can get you through the day without any major issues either of them will do just fine. That said, the Samsung Galaxy Core 2 is a bit more powerful as it comes with a quad-core processor clocked at 1.2 GHz with 768 MB of RAM, which pretty much eclipses the dual-core @ 1.0 GHz CPU with 512 MB of RAM found on the Samsung Galaxy Ace 2. Aside from that though, there are plenty of similarities between the two when it comes to the hardware, with the only major difference being the battery life. The Samsung Galaxy Core 2 and the Samsung Galaxy Ace 4 both pack 5 MP primary cameras along with VGA secondary shooters. The initial storage memory is also identical at 4 GB with microSD card support that can go up to an additional 64 GB of storage. As for the battery, we’re looking at a 2,000 mAh unit for the Samsung Galaxy Core 2 and only a 1,500 mAh one for the Samsung Galaxy Ace 4. However, the latter seems to be better optimized because it last for about 11 hours of constant talking in a 3G network while the former can only go for about 7 hours of uninterrupted 3G talk-time. On the software side, there’s not a whole lot to talk about as both handsets run on the same operating system version, namely Android 4.4.2 KitKat. A quick peak at the specifications reveals that the Samsung Galaxy Core 2 has an edge over its competitor when it comes to raw power, but as we all know, power isn’t everything. Battery life is a major issue with this device as it seems to drain unusually fast not only when playing games or browsing the internet, but also when your simply talking on the phone. The Samsung Galaxy Ace 4 is a bit better at preserving battery life, but one the other hand, it suffers from lower performance due to only featuring 512 MB of RAM. On the bright side, the screen quality is quite good but you’ll have to settle for a smaller display, which may or may not be a good thing depending on individual preference. The same can be said about the design as well. Although some would agree that the Samsung Galaxy Core 2 is a prettier device, others might actually enjoy the compact design and rounded edges offered by the Samsung Galaxy Ace 4. All in all, we’re looking at several strengths and weaknesses for each smartphone and it will be up to you to decide which of them is better suited to your needs. But before jumping to any conclusions, let’s take a look at the price as well. Always an important aspect to keep in mind, the price more often than not can determine if a smartphone is even worth taking into consideration. If you’re in the market for an affordable handset you will find quite a few that are cheaper than these ones, but if you must choose between the Core 2 and the Ace 4 I think we can make that choice just a little bit easier. The Samsung Galaxy Core 2 is currently available for about $150, give or take a few bucks, while the Samsung Galaxy Ace 4 can usually be found for about $120. Naturally, these prices may vary depending on where you’re looking to buy and in which country. Another important aspect that I neglected to mention earlier is that out of the two, only the Samsung Galaxy Core 2 comes with dual-SIM capabilities. All in all, I would say that the Core 2 seems just a little bit better when we take everything into consideration, but not by a huge margin. That said, you might like the Samsung Galaxy Ace 4 better, in which case you should definitely go for it because it’s a pretty decent smartphone as well. As always, the final choice is up to you.